A powerful, cloud-based IT Management solution to manage, update and configure settings for Sennheiser headsets and speakerphones in your company. Keep in touch with one single tool, from any location. End time-consuming manual headset updates and lengthy reporting. Free up IT resources by managing your resources effectively. Improve productivity while minimizing downtime and workflow disruption. Limited to 1 trial with 1-200 users per customer. The trial period is not extendable. Please note that Sennheiser reserves the right to qualify the incoming requests. How to fill in the form. 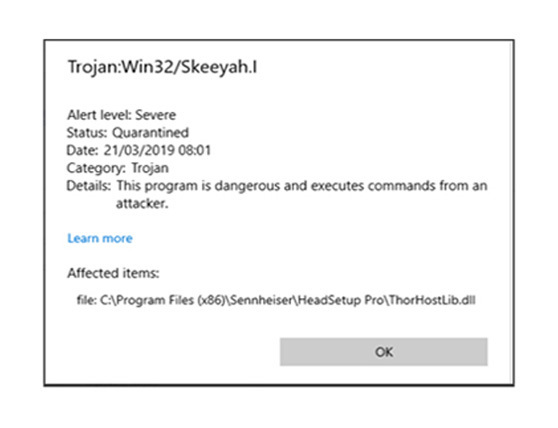 Computers around the world received the message, that the trojan “Skeeyah.l” had been detected in the file “ThorHostLib.dll”, distributed with Headsetup Pro from Sennheiser communication. Windows Defender flagged the file as "suspicious", therefore it was promptly quarantined as a precaution. The issue has now been investigated by Windows support, and they declared the file as “clean” and removed the warning again. This means it was a “false alarm” and is no longer detected as malicious software by Microsoft Defender. The quarantined file enables communication between certain Sennheiser DECT products and Headsetup Pro for software update and product configuration. The functionality of the products is not affected at all. However, as quarantined files will not automatically reappear in the system, Sennheiser Communications has decided to issue a forced update for all versions of HeadSetup Pro. This will take care of all erroneous security warnings and re-enable configuration of all headsets. Rollout is expected to be completed worldwide within a few days. We apologize for any inconvenience caused by this event. November 23rd - Following a vulnerability identified in Sennheiser HeadSetup and HeadSetup Pro, new versions have been made available. Updating the software to its latest version will rid the software of vulnerable certificates. Additionally, the invalidation by Windows November 27th of the former certificates fully eliminate the possibility to exploit the certificates. HeadSetup: v.8.1.6114 (for PC) and v7.0.8711 (for Mac). Mac users and Windows users, that are unable to receive automatic updates from Microsoft or choose not to update their HeadSetup and HeadSetup Pro software, can find removal instructions for Macs and PCs.